The VWR 89511-418 Gravity Convection Incubator offers a compact, efficient and gentle environment ideal for open plates and containers. This 2.6 cu ft incubator has a heat up time of 25 minutes, and the added convenience of allowing users to choose their own on and off times. 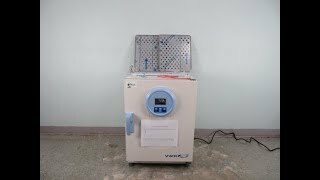 The VWR microbiological incubator has intuitive digital control and features dual sensor overtemperature protection and alarms for added peace of mind. The excellent temperature uniformity coupled with the naturally gentler airflow of this lab incubator make it a great choice for open containers and keeps them from drying out. This lab incubator has a wide temperature range of between 5° above ambient to 75 °C, with a uniformity of 0.6°C, with perforated stainless shelving designed to allow heat to evenly distribute. The stainless shelving is also simple to adjust and can hold up to 55 lbs each. The interior of this VWR incubator is a corrosion resistant mirrored stainless steel with smooth, rounded corners and is covered with a tempered glass door that allows users to check on sample progress without disturbing the environment. The VWR 89511-418 Gravity Convection Incubator can be connected to a PC through a standard RS-232 interface and has an internal access port for additional instrumentation or probes. This VWR Gravity Convection Incubator 89511-418 is a brand new instrument fully tested by our service team with a clean bill of health. All of our lab equipment comes backed with our standard warranty. Should you have any questions about this or any of our other lab incubators, please don't hesitate to contact us.